Looking for the perfect holiday dessert? TODAY's Samah Dada has you covered with a no-bake recipe that couldn't be simpler. Want to know something funny? These delightfully decadent and creamy pecan pie bars were actually a complete kitchen accident. I’ll take you back to where it all began: cut to me in my New York City apartment, attempting to create a vegan caramel sauce. I had started with some coconut sugar, maple syrup, applesauce and almond milk — and I absolutely loved the taste. Then I went to my pantry to find a nut butter to add another layer of flavor and found a jar of pecan butter that I had completely neglected ... which is crazy because that stuff is not cheap! Then a lightbulb went off. I thought to myself, "What if I used this caramel sauce as a filling for pecan bars that I could set on a pecan-based raw crust?" 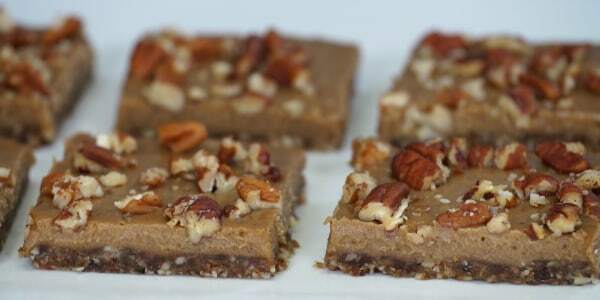 And just like that, this raw, vegan, no-bake pecan bar recipe was born. 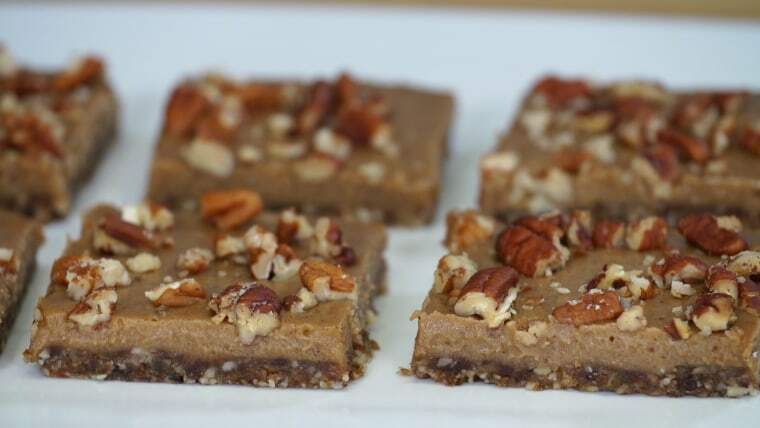 Inspired by the flavors of a traditional pecan pie, these bars are still creamy and nutty, but also have an incredible texture. They’re perfect for the holidays but, let’s be real, I would never confine these gems to serving them only once a year. They're so easy to make that they might just become a weekly addition to your (no-bake) baking routine. Let’s start with the crust. It's crunchy and chewy because it's made with pecans and dates, which are totally sweet enough on their own so you don't need to add any extra sugar. I call dates "nature's candy" (isn't that romantic?) 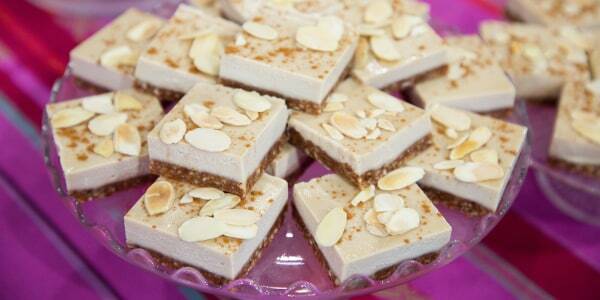 because they add an amazing caramel-like sweetness to any recipe. Vanilla and cinnamon give the crust an extra boost of warmth that perfectly complement the nuts inside. The filling — which I could most definitely eat straight up with a spoon but always exercise extreme restraint not to — uses no refined sugar, either. I sweeten it with a mix of maple syrup and coconut sugar, flavors that work well together to create a delightfully cozy taste. Applesauce, pecan butter, almond milk and coconut oil make the filling amazingly smooth and velvety. The only slightly difficult part about this recipe is ... the waiting! After pouring the filling on top of the crust, you have to let the bars freeze for about 4 to 5 hours. When you're ready to serve it, I find that it's easiest to slice the bars after letting them thaw for a few minutes. Also, make sure to wipe your knife between cutting every slice for a clean result. But trust me, it's all worth it because the end result is like a cross between an ice cream bar, a pecan pie and your favorite candy bar. 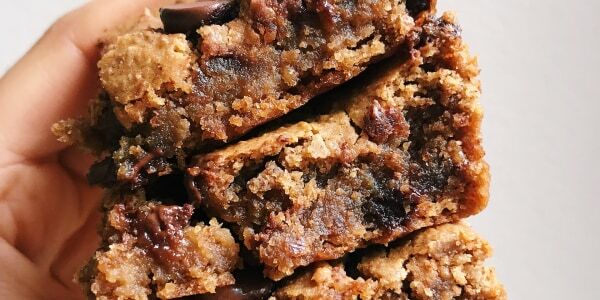 When I first had my friends over for a new dessert taste test and whipped out these pecan pie bars, they could not believe they were vegan and gluten free. I can’t wait for you to share these with your friends and family, too!